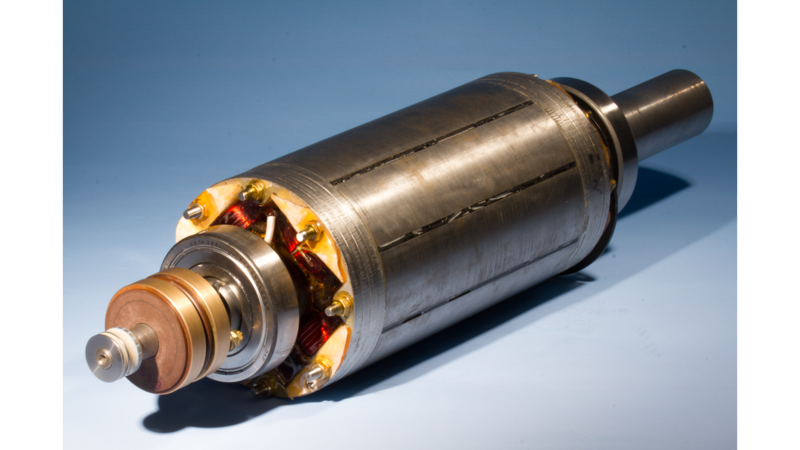 Not having electric motors in everyday life is inconceivable: In a fixed machine component, the stator, a winding generates a rotating magnetic field. The pivoted rotor orientates its movement on this magnetic field, thus generating mechanical power in the form of rotation via a drive shaft. Depending on the direction of rotation and force, this electric machine can operate as a motor or a generator. So-called synchronous machines, in which the rotor rotation is synchronised with the rotating field of the stator, feature two mechanisms to generate power: attraction by the magnetic north and south poles and the magnetic attraction of iron. For these synchronous motors, KIT scientists have optimised the structure of the rotor with the aim of building stronger drives with better energy conversion efficiency but using the same size of motor. In conventional machines, the geometric alignment of the two power-generating principles is not optimal, owing to the type of design. Depending on the positioning of the rotor in relation to the stator field, only one of the two forces respectively attains a maximum. Structural modifications in rotor geometry enable the system to be changed, allowing an optimum exploitation of both forces.The generation of a magnetic field in the rotor is a further novelty. Either permanent magnets or coils are used for this purpose. The new motor combines both options, with the permanent magnets maintaining a high level of energy conversion efficiency and the coils enabling changes in the magnetic field &apos;s strength and alignment. This ensures that the torque generated can be maximised at any rotational speed and that losses can be minimised.A prototype has already been tried out successfully on the test bench.